The Phoenix Business Journal reports that the case of a Gilbert, Arizona USA nail salon owner who provided “fish pedicures,” to remove dead skin is getting her day in court against state regulators. A Maricopa Superior Court will hear the case pitting the Arizona Board of Cosmetology against Cindy Vong’s LaVie Nail Salon. The case, thus far, has drug on for four years. The court hearing will start Monday, 14 January 2013. The state board stopped Vong from offering the service in which small toothless fish are used to nibble away at dead skin on customers’ feet. The cosmetology board stopped the service citing health concerns. The USA Centers for Disease Control (CDC) states that it is unaware of any published report of illnesses resulting from fish pedicures. On the contrary, the CDC reports that one study actually found that fish pedicures were effective in the treatment of psoriasis. The CDC is a very reputable source, says Beel. Chinese chinchin, another fish species that is often mislabeled as doctor fish and used in fish pedicures, grows teeth and can draw blood which increases the risk of infection. According to the U.S. Fish and Wildlife Service, doctor fish Garra rufa could pose a threat to native plant and animal life if released into the wild because the fish is not native to the United States. Beel notes that only two of these reasons really have any relevance to human health. Maybe the third. But Beel thinks using piranha might not be too wise either. But who’s going to? Most of these reasons are pretty lame. 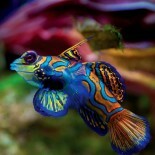 This entry was posted on January 14, 2013 by denstormer in Beel Bemused and tagged little fishes.